Reports of plans for a high-performance piloted replacement for the SR-71 date back more than a decade. In 1979 it was reported that a Mach 4, 200,000-ft.-altitude aircraft that could be a follow-on to the Lockheed SR-71 strategic reconnaissance vehicle in the 1990s has been defined by the Air Force Aeronautical Systems Division and Lockheed." As previously noted, reports of the existence of a successor to the SR-71 surfaced repeatedly during the debate over termination of the SR-71. Subsequent observations of mysterious aerial phenomena have been connected with the 1988 reports that Aurora was a Mach 6 stealthy reconnaissance aircraft that was being develoPDWE to replace the SR-71. The plane's real name has been kept a secret along with its existence. This is not unfamiliar though, the F-117a stealth fighter was kept a secret for over ten years after its first pre-production test flight. The project is what is technically known as a Special Access Program (SAP). More often, such projects are referred to as "black programs." So what was the first sign of the existence of such an aircraft? On 6 March 1990, one of the United States Air Force's Lockheed SR-71 Blackbird spy planes shattered the official air speed record from Los Angeles to Washington's Dulles Airport. There, a brief ceremony marked the end of the SR-71's operational career. Officially, the SR-71 was being retired to save the $200-$300 million a year it cost to operate the fleet. Some reporters were told the plane had been made redundant by sophisticated spy satellites. The Aurora has said to have a speed any were between mach 6-12, this is to wide a range of possible speeds. It is most likely that it's speed is between mach 6-8, and an altitude of 150-200 thousand feet. Keeping an aircraft cool during extreme speeds is a primary challenge of hypersonic flight (mach 5+). According to studies done by General Dynamics and Boeing, an aircraft traveling at speeds of mach 5.5 and 6 would have an average skin temperature of approximately 1100-1300 degrees Fahrenheit. The majority of this heat would be concentrated at the front of the airplane. This this aircraft may indeed exist. There has been research in to what are called Pulsed Detonation Engines (PDE's) also refereed to as Pulsed Detonation Wave Engines. These are different type of engine than the pulse jet engines, which is already publicly know, and has been tested in aircraft. 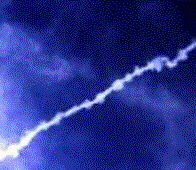 The PDWE's are said to be in laboratory and computer analysis level of development (reported oct of 91) The PDWE's exhaust emission produces smoke trails that closely match the pulser aircraft. Simulations of theses engines are said to be able to propel large aircraft in the "Mach 0.2-3.0 flight regime"
How PDWE's work: PDWE's use shock waves created in a detonation to compress the fuel-oxidizer mixture prior to combustion. A cylinder chamber designed to support the detonation is constructed with a flat forward end which makes up the thrust wall. Air along with fuel is fed into the engine from behind the thrust-wall. The detonation wave created travels forward to the thrust wall at about Mach 4 and compresses the fuel-air mixture, promotes supersonic combustion and causes a pressure rise in the engine. The wave then strikes the thrust wall and rebounds accelerating the combustion products towards the nozzle. Some of the products are ejected by the wave to the outside air-stream through the air inlet openings creating a toroidal vortex out side the engine. Then the cycle repeats. Theoretically a higher fuel efficiency than a "constant pressure engine"
Engines can be produced in many sizes and thrust outputs from a few inches in diameter at a thrust of several pounds to larger one that can output in the thousands of pounds range. They are mechanically simple, and have few moving parts. They could operate in or out of the atmosphere using fuel oxidizers. There is very little information on the other reported aircraft. It is reported as "A triangular-shaped, quiet aircraft". This craft has been seen by many observers and flying with several F-117 stealth aircraft. One option for a hypersonic vehicle might be four or six Pulse Detonation Wave Engines (PDWEs), fuelled with liquid methane. As air breathers, these PDWEs could theoretically propel a hypersonic aircraft towards Mach 10 at an altitude in excess of 180,000 feet. Used to power an trans-atmospheric vehicle, the same PDWEs might be capable of lifting the craft to the edge of space when switched to rocket mode. Liquid methane or liquid hydrogen is ejected onto the fuselage, where the fuel mist is ignited, possibly by surface heating. 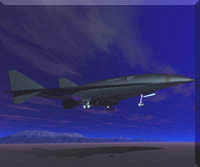 The PDWE works by creating a liquid hydrogen detonation inside a specially designed chamber when the aircraft is traveling beyond the speed of sound. When traveling at such speeds, a thrust wall (the aircraft is traveling so fast that molecules in the air are rapidly pushed aside near the nose of the aircraft which in essence becomes a wall) is created in front of the aircraft. When the detonation takes place, the airplane's thrust wall is pushed forward. This process is continually repeated to propel the aircraft. From the ground the jet stream looks like "donuts-on-a-rope" contrail. Quoted below is a small description of how a PDWE would accelerate a vehicle towards the hypersonic regime. "...use a shock wave created in a detonation - an explosion that propagates supersonically- to compress a fuel-oxidizer mixture prior to combustion, similar to supersonic inlets that make use of external and internal shock wave for pressurization." Not much is known about Pulse Detonation Wave technology, but there have been quite a few reports and sightings of mysterious aircraft using propulsion technology unlike any heard or seen before. On February 25, 26, and 27, 1992, there were night-time sightings of an unknown aircraft with a "diamond-pattern" of lights at Beale Air Force Base, which was thought to be the Aurora aircraft. The aircraft had a distinctive engine noise, described as "a very, very low rumble, like air rushing through a big tube." On the night of February 26, what was thought to be a ground test of Aurora's propulsion systems took place. A series of "booms" was heard and described as similar to "artillery fire" and "deep bass notes, not like sonic booms." It was thought these were "light-off" tests of the engines. It was speculated that the aircraft was using Pulse Detonation Wave Engines. The noise and low frequency would, it was said, be consistent with PDWE technology. Pulse Wave Detonation Engines (PWDE) - for the most part liquid methane or liquid hydrogen is ejected onto the fuselage, where the fuel mist is ignited, possibly by surface heating. The PDE Pulse Detonation Engine works by creating a liquid hydrogen detonation inside a specially designed chamber when the aircraft is traveling beyond the speed of sound. When traveling at such speeds, A thrust wall ( the aircraft is traveling so fast that molecules in the air are rapidly pushed aside near the nose of the aircraft which in essence becomes a wall) is created in front of the aircraft. When the detonation takes place, the airplanes thrust wall is pushed forward. This all is repeated to propel the aircraft. From the ground the jet stream looks like "donuts on a rope". Some people think this method is very strange because when you are traveling at the speeds we are talking about (mach 5-8) extensive heating is a problem. So the last thing you would want to do is detonate a explosion outside the airplane and heat it up more.